In this lesson you will hear some very important tips on what to do with your upper body to make this position easier and look great!! Hear important feedback from Sk8er Niki Hunter. It is so great to hear how it actually feels from a Sk8ers point of view. See a fantastic demonstration of a broken leg spin. 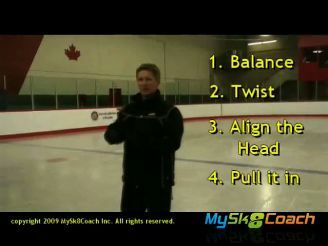 Reminders to get as low as possible to meet the ISU sit spin criteria. SKU: 0097 Categories: Spins, Sit, Sit Side Product Coach: Paige Aistrop. Product Skill Level: Intermediate. Product Lesson Type: Private. Be the first to review “Broken Leg 2” Click here to cancel reply.